Anyone familiar with the brand Chopard knows how thanks to the many interpretations of its Mille Miglia chronograph the Fleurier brand has always been linked to the world of vintage racing. LUC Engine One H but instead have an aluminum frame, has a titanium case, and inside beats is a mechanical movement with manual winding, quiet but controlled by a tourbillon. Mount the LUC Calibre 2.4-L manufacturing, which already in the profile incorporates the air intakes of racing cars. The heads of the engine block have inspired the two straps screwed you see on the dial at 12 o’clock and 6 o’clock: they are not just a particular aesthetic, but they are part of the plate along with the functionality of the movement. The latter thanks to two glasses of sapphire is visible from both sides. Hours and minutes are shown in the center while the reserve is on the left, drawing the fuel level indicator. The small seconds are mounted on tourbillon on the right. With five rows of stitching, the alligator strap recalls the aesthetics of the car seats of the 60s and 70s. 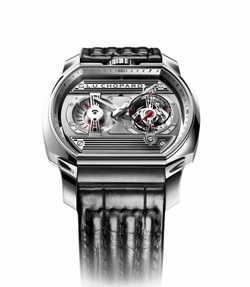 The caliber of this watch Chopard boasts some parallelism in more with the world of his “colleagues mechanical”, especially with regard to the aesthetics of the bridges in German silver is identical to aluminum cylinder heads of racing engines and the that is mounted on silent blocks that by acting as shock absorbers protect it from shocks. Its tourbillon adjusts the frequency of 28,800 alternations / hour for an autonomy of 60 hours and as Chopard is used to doing, I would say with all its watches, is certified by the COSC chronometer. The lightweight case material – titanium – is another reminder to the world of four wheels.